We live in a technologically advanced time. It seems as if everything in our lives is interconnected. From our smartphones, we can control every aspect of our homes, including the lighting, temperature, locks and even the blinds! While this technology brings us so much good, can it also come back to hurt us? Can a smart home hurt your divorce case? Getting divorced is never easy. Building a life with someone, only to watch it crumble, can take a steep emotional and physical toll. Many people seeking legal advice concerning smart devices and divorce proceedings wonder if the evidence they are able to acquire is admissible in family court. Often, the answer is yes. Even in instances where the information gathered may not be used directly in court – such as with some recordings – they may still be used and considered by both legal counselors, any court-assigned therapists, or other family experts who may have a say in the court’s determinations. If a spouse believes that their partner is cheating on them, a smart home may help them gather evidence to prove their case. A conversation between a cheating partner and another person, for example, may be picked up on a recording device. Or, perhaps they were caught on the home’s interior security cameras with someone else when they claimed they were elsewhere. In the case of accusations of domestic violence or abuse, a smart home can play a pivotal role in providing evidence of abuse. Beyond simply recording proof of violence, once the victim is out of the home, smart devices can prove if an abusive ex is still harassing their former spouse. The devices can also show who is logging in to home security systems to show if an ex is monitoring you when you are at home. Or, perhaps they are switching on and off smart lights, or altering the thermostat to make your life miserable. These are all pieces of evidence which can influence a divorce case. Today’s world is fast-paced – and so is the advancement of technology. While technology races towards the future, the law needs some time to catch up. As a result, the legal status of smart home devices in a court of law is difficult to ascertain. As such, you should always consult with an experienced Florida divorce attorney regarding any particular questions you may have regarding technology and divorce. So, if you are considering divorce, you need to contact an experienced attorney right away. As contested divorces can be difficult situations to navigate, you need an attorney who knows how to get you the results you want and need. Patrick Cordero has extensive experience in all facets of law, including family and financial law. Call The Law Offices of Patrick L. Cordero for a free consultation today at (305) 445-4855. This entry was posted in Uncategorized on January 14, 2019 by wpadmin. Going through a bankruptcy may be overwhelming, yet also interesting. Although on one hand, it has its challenges, on the other, it allows you to establish a clean slate. Bankruptcy may be a painful past that no one wants to remember, but remembering is actually the very first thing you need to do to improve your credit score. First and foremost, you must determine the cause of the bankruptcy to prevent ever having to deal with it again. Recall what you may have done wrong, and what type of transactions you’ve done. This way, if you see yourself engaging in the same pattern, you can stop yourself from falling into the same pitfalls. If you’re left with some restructured debts that you need to pay, you must first show that you are capable of paying them off. Don’t start dealing or initiating other transactions right away. First, prove that you can meet current debt payments on your own without seeking financial help from others. You will eventually improve your income to debt ratio as well as your credit standing. A lot of lenders are half-hearted when dealing with a borrower who maintains many outstanding debts. It’s best to pay outstanding debts first, and you should be ready to go. You are given a fresh new start to take more time and focus on budgeting and planning among all else. Your credit score is important, but so are your savings, and your emergency fund. Stay on top of your finances by first putting part of your money on savings and emergency funds. Once this is established, plan the remaining money for other necessary expenses. This may not seem much, but saving money for emergencies can save you from unexpected expenses that may hinder the improvement of your credit standing. Now that you have shown your capabilities of handling debts and current finances, you must show lenders that you are worth investing in. You may do this by applying for a secured credit card, or a secured loan. You may also ask someone with a good credit standing to co-sign your credit card or loan. Having security over your transactions will improve your credit score, as banks or other financial institutions will consider you as a risk-free investment. Now that you have dealt with your past expenses, and have learned to budget and plan your finances, the only thing left to do is to pay your debts on time. This is the culmination of everything you’ve worked hard to get back. If you consistently pay your debts on time, you’ll be able to improve your credit score over time and even surpass your best credit standing. 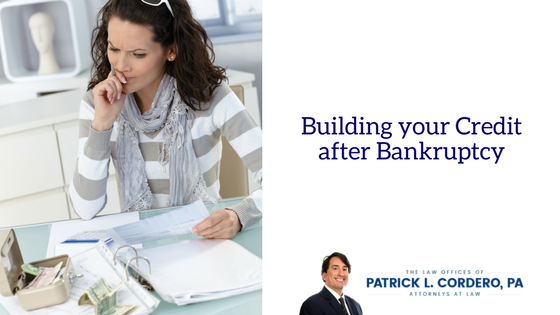 Life after bankruptcy may be difficult to manage but it doesn’t have to stay that way. There are plenty of means to build your credit standing. If you want to learn more about improving your credit, feel free to contact us and schedule a consultation. Get in touch with us by calling 305-445-4855. We can help you file for bankruptcy relief and assist you in getting back on your feet. This entry was posted in BANKRUPTCY, Uncategorized on December 22, 2017 by wpadmin. DO YOU NEED A LAWYER TO FILE FOR BANKRUPTCY? On behalf of Law Offices of Patrick L. Cordero, PA posted in Bankruptcy on Tuesday, January 10, 2017. When hard times hit, many people are forced to turn to payday loans and credit cards to get by. Once this process begins, it can be difficult to stop. Interest builds and as the number of payments increase, there is less money left to pay out, leading to a downward spiral that has pulled many Americans into a seemingly hopeless position. Often the only choice available when this point is reached is to file for bankruptcy to get a clean start and try again. The question that remains is whether or not to hire an attorney. There are also several aspects of your case that a bankruptcy lawyer can advise you about. Some of the most common topics for discussion include whether or not you should continue to make payments to your creditors. You can also get help deciding which chapter to file under and whether you should file a bankruptcy petition. The tax consequences of filing and information about whether you should discharge debts or keep your vehicle or home after claiming bankruptcy can also be discussed. Since the judge and other employees in the court are unable to offer legal advice due to restrictive laws, the information an attorney can give may be crucial to the success of your case and your life after filing. Some people believe that filing pro se with a non-attorney petition preparer can offer the same benefits, but these assistants are not allowed to represent you in court or give any answers to legal questions. The paperwork can be confusing and mistakes can affect the success of your case. When using legal help, it is advisable to wait to make any important decisions until you have spoken with your lawyer. U.S. News cautions against transferring assets or making other changes until you discuss these options with your attorney. if you need to file for bankruptcy, contact an experienced attorney today. The guidance of a legal professional can ensure that you reach the best outcome possible as you get a fresh beginning and start on the road to financial recovery. This entry was posted in Uncategorized on October 3, 2017 by wpadmin.